This is the start to our 12 days of Easter Ideas! Wooohooo! I just love Easter and all the fun Spring colours and themes. So, to celebrate, over the next 12 days I will be sharing some very clever crafts and recipes from my blogger friends and I to celebrate the Easter holiday! Today’s recipe comes from <a href=”http://www.savingyoudinero.com/2015/…/18/jelly-bean-cookies/” target=”_blank”>SavingYouDinero.com</a>. During the Easter holiday, I am sure that we have a ton of jelly beans in the house. 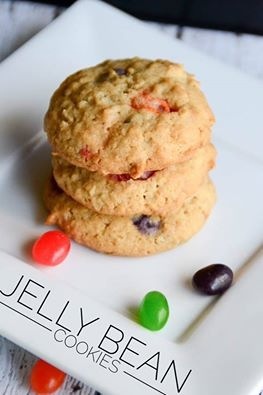 Use them to make some yummy <a href=”http://www.savingyoudinero.com/2015/…/18/jelly-bean-cookies/” target=”_blank”>Jelly Bean Cookies</a> to serve at Easter dinner! Make sure you also check out the other recipe and craft ideas from my blogging buddies below!